Johnson's career achievements include three NBA MVP Awards, nine NBA Finals appearances, twelve All-Star games, and ten All-NBA First and Second Team nominations. He led the league in regular-season assists four times, and is the NBA's all-time leader in average assists per game, at 11.2. Johnson was a member of the 1992 United States men's Olympic basketball team ("The Dream Team"), which won the Olympic gold medal in 1992. 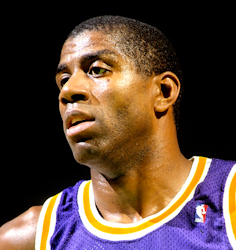 After leaving the NBA in 1992, Johnson formed the Magic Johnson All-Stars, a barnstorming team that travelled around the world playing exhibition games. Johnson was honored as one of the 50 Greatest Players in NBA History in 1996. 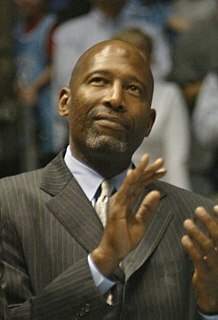 Johnson became a two-time inductee into the Basketball Hall of Fame—being enshrined in 2002 for his individual career, and again in 2010 as a member of the "Dream Team". He was rated the greatest NBA point guard of all time by ESPN in 2007. His friendship and rivalry with Boston Celtics star Larry Bird, whom he faced in the 1979 NCAA finals and three NBA championship series, are well documented. ESPN is a U.S.-based pay television sports channel owned by ESPN Inc., a joint venture owned by The Walt Disney Company (80%) and Hearst Communications (20%). The company was founded in 1979 by Bill Rasmussen along with his son Scott Rasmussen and Ed Egan. Lansing is the capital of the U.S. state of Michigan. It is mostly in Ingham County, although portions of the city extend west into Eaton County and north into Clinton County. The 2010 Census placed the city's population at 114,297, making it the fifth largest city in Michigan. The population of its Metropolitan Statistical Area (MSA) was 464,036, while the even larger Combined Statistical Area (CSA) population, which includes Shiawassee County, was 534,684. It was named the new state capital of Michigan in 1847, ten years after Michigan became a state. William Felton Russell is an American retired professional basketball player who played center for the Boston Celtics of the National Basketball Association (NBA) from 1956 to 1969. A five-time NBA Most Valuable Player and a twelve-time All-Star, he was the centerpiece of the Celtics dynasty that won eleven NBA championships during his thirteen-year career. Russell and Henri Richard of the National Hockey League are tied for the record of the most championships won by an athlete in a North American sports league. Russell led the University of San Francisco to two consecutive NCAA championships in 1955 and 1956, and he captained the gold-medal winning U.S. national basketball team at the 1956 Summer Olympics. Vernon Earl Monroe is an American retired professional basketball player. He played for two teams, the Baltimore Bullets and the New York Knicks, during his career in the National Basketball Association (NBA). Both teams have retired Monroe's number. Due to his on-court success and flashy style-of-play, Monroe was given the nicknames "Black Jesus" and "Earl the Pearl". Monroe was inducted into the Naismith Memorial Basketball Hall of Fame in 1990. Marques Haynes was an American professional basketball player and member of the Harlem Globetrotters, notable for his remarkable ability to dribble the ball and keep it away from defenders. According to the 1988 film Harlem Globetrotters: Six Decades of Magic, Haynes could dribble the ball as many as 348 times a minute. Jerry Alan West is an American basketball executive and former player who played professionally for the Los Angeles Lakers of the National Basketball Association (NBA). His nicknames included Mr. Clutch, for his ability to make a big play in a clutch situation, such as his famous buzzer-beating 60-foot shot that tied Game 3 of the 1970 NBA Finals against the New York Knicks; The Logo, in reference to his silhouette being incorporated into the NBA logo; Mr. Outside, in reference to his perimeter play with the Los Angeles Lakers; and Zeke from Cabin Creek, for the creek near his birthplace of Chelyan, West Virginia. West played the small forward position early in his career, and he was a standout at East Bank High School and at West Virginia University, where he led the Mountaineers to the 1959 NCAA championship game. He earned the NCAA Final Four Most Outstanding Player honor despite the loss. He then embarked on a 14-year career with the Los Angeles Lakers, and was the co-captain of the 1960 U.S. Olympic gold medal team, a squad that was inducted as a unit into the Naismith Memorial Basketball Hall of Fame in 2010. James Ager Worthy is an American former professional basketball player who is currently a commentator, television host, and analyst. Named one of the 50 Greatest Players in NBA History, "Big Game James" was a seven-time NBA All-Star, three-time NBA champion, and the 1988 NBA Finals MVP with the Los Angeles Lakers in the National Basketball Association (NBA). Michael Jerome Cooper is an American basketball coach and former player. He was most recently the head coach of the Atlanta Dream of the Women's National Basketball Association (WNBA). Prior to joining Atlanta, he coached women's college basketball with the USC Trojans. 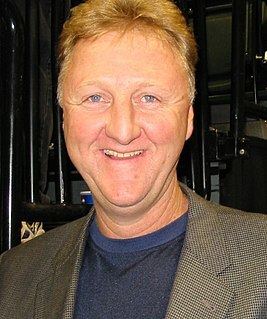 A former player in the National Basketball Association (NBA), Cooper won five NBA championships with the Los Angeles Lakers during their Showtime era. He has also coached in the NBA, WNBA, and the NBA Development League. Cooper is the only person to win a championship, as either a coach or a player, in the NBA, WNBA, and the NBA D-League. Luke Theodore Walton is an American professional basketball coach and former player who is the head coach of the Sacramento Kings of the National Basketball Association (NBA). He played 10 seasons in the NBA as a forward, winning two NBA championships with the Los Angeles Lakers. He also won a title as an assistant coach with the Golden State Warriors, and was the head coach for the Lakers from 2016 through 2019. Mitchell Kupchak is an American professional basketball executive and retired player. He is the current president of basketball operations and general manager of the Charlotte Hornets of the National Basketball Association (NBA). 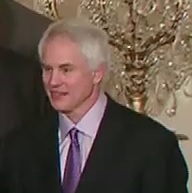 As a college player, Kupchak was an All-American at the University of North Carolina and a member of the gold medal-winning 1976 United States Olympic team. As a professional player, he won three NBA titles – one as a member of the Washington Bullets and two with the Los Angeles Lakers. The Celtics–Lakers rivalry is a National Basketball Association (NBA) rivalry between the Boston Celtics and the Los Angeles Lakers. The Celtics and the Lakers are the two most storied franchises in the NBA, and the rivalry has been called the best in the NBA. The Boston Celtics and the Los Angeles Lakers have met a record 12 times in the NBA Finals, starting with their first Finals meeting in 1959. They would both go on to dominate the league in the 1960s and 1980s, facing each other six times in the 1960s, three times in the 1980s, and two times in 2008 and 2010. The Los Angeles Lakers franchise has a long and storied history, predating the formation of the National Basketball Association (NBA). Steven Charles Mix, nicknamed The Mayor, is an American former professional basketball player and coach. Mix had a thirteen year playing career, was an NBA All-Star and played in the NBA Finals on four occasions. He had a lengthy career as a broadcaster for the Philadelphia 76ers. Reginald Wayne Theus is an American retired basketball player and the former head coach of California State University, Northridge. He formerly served as head coach for the NBA's Sacramento Kings and New Mexico State University's men's basketball team. He was also an assistant coach for the University of Louisville under Rick Pitino. The 1987 NBA Finals was the championship round of the National Basketball Association (NBA)'s 1986–87 season, and the culmination of the season's playoffs. The Western Conference champion Los Angeles Lakers defeated the Eastern Conference and defending NBA champion Boston Celtics 4 games to 2. 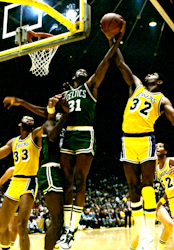 The key moment of the series was Magic Johnson's junior sky hook in Game 4. This was the tenth time that the Celtics and Lakers met in the NBA Finals. It would be the Celtics' last Finals appearance until the two teams met in 2008. The highlight of the Los Angeles Lakers season of 1979–80 was rookie Magic Johnson leading the Lakers to their seventh NBA Championship, defeating the Philadelphia 76ers in six games in the NBA Finals. This was also the team's first season under the ownership of Jerry Buss. Magic's season represented the birth of the Showtime Lakers. The 1981–82 NBA season saw the Lakers win their eighth NBA championship. 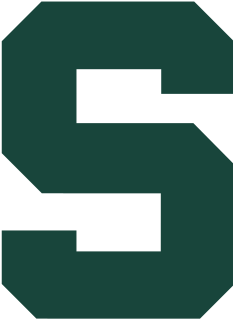 The 1978–79 Michigan State Spartans men's basketball team represented Michigan State University in the 1978–79 NCAA Division I men's basketball season. The Spartans were coached by Jud Heathcote in his third year and played their home games at Jenison Field House in East Lansing, Michigan. They were members of the Big Ten Conference. The Spartans finished the season 26–6, 13–5 in Big Ten play, finishing in a tie for first place in the Big Ten. They received a bid to the NCAA Tournament and defeated Indiana State for the National Championship. This marked the school's first National Championship in basketball. In basketball, Showtime was an era in Los Angeles Lakers history when the National Basketball Association (NBA) team played an exciting run-and-gun style of basketball. Led by Magic Johnson's passing skills and Kareem Abdul-Jabbar's scoring, the team relied on fast breaks and won five NBA championships. Lakers owner Jerry Buss purchased the team in 1979, and he wanted their games to be entertaining. He insisted that the Lakers play an up-tempo style, and the team hired dancers and a live band for their home games at The Forum. The team established a Hollywood-celebrity following. ↑ "All Time Leaders: Assists Per Game". www.nba.com. Turner Sports Interactive, Inc. Retrieved May 8, 2008. 1 2 3 4 5 6 7 8 9 10 11 12 13 14 15 "Magic Johnson Bio". NBA Encyclopedia: Playoff Edition. Retrieved May 8, 2008. 1 2 3 "Daily Dime: Special Edition – The 10 Greatest Point Guards Ever". www.sports.espn.go.com, May 11, 2006. Retrieved September 13, 2007. 1 2 3 4 Rovell, Darren (October 8, 2005). "Passing on the Magic". www.espn.com. Archived from the original on November 25, 2005. Retrieved May 8, 2008. ↑ Haire, Thomas (May 1, 2003). "Do You Believe in 'Magic'?". Response Magazine. Questex Media Group, Inc. Archived from the original on October 26, 2006. Retrieved May 27, 2008. 1 2 Springer, Steve (November 7, 2001). "Magic's Announcement: 10 years later, a real survivor". Los Angeles Times. p. D1. 1 2 3 4 5 Weinberg, Rick. "Magic Johnson announces he's HIV-positive". www.espn.com. Archived from the original on September 14, 2011. Retrieved May 30, 2017. 1 2 3 "Magic Touch: Magic Johnson's Fast Break Into Business." www.success.com. Retrieved May 9, 2017. 1 2 Rohlin, Melissa (February 4, 2014). "Magic Johnson and other Dodgers owners purchase the Sparks". Los Angeles Times. Retrieved August 29, 2017. ↑ Eldridge, Earle (November 8, 2004). "Rebounding from basketball court to boardroom". USA Today. Retrieved February 23, 2009. ↑ Magic was the fourth of seven children Earvin Sr. and Christine had together. 1 2 3 Roselius, Chris J. Magic Johnson: Basketball Star and Entrepreneur. ISBN 1-61714-945-4. Google Books. Retrieved May 26, 2013. ↑ McClelland, Edward. Nothin' But Blue Skies: The Heyday, Hard Times, and Hopes of America's Industrial Heartland. p. 321. ISBN 978-1-60819-529-9. Google Books. Retrieved June 7, 2015. ↑ Zillgitt, Jeff (September 27, 2002). "Magic Memories of a Real Star". USA Today. Retrieved November 1, 2007. 1 2 3 4 5 6 7 Schwartz, Larry. "Magic made Showtime a show". www.espn.go.com. Retrieved September 13, 2007. ↑ "1978 Men's NCAA Basketball Tournament". www.cbssports.com. Retrieved May 6, 2008. ↑ Katz, Andy. "From coast to coast, a magical pair". www.espn.com. Retrieved May 6, 2008. ↑ "Consensus All-America Teams (1969–70 to 1978–79)". www.sports-reference.com. Retrieved September 17, 2017. 1 2 3 4 5 6 7 8 9 10 11 12 13 "Magic Johnson Statistics". www.basketball-reference.com. Retrieved September 13, 2007. ↑ "Regular Season Records: Points". www.nba.com. Retrieved February 28, 2009. 1 2 3 4 "Rookie Makes the Lakers Believe in Magic". NBA Encyclopedia: Playoff Edition. Retrieved May 7, 2008. 1 2 Helin, Kurt (March 5, 2014). "The Extra Pass: Talking "Showtime" Lakers with author Jeff Pearlman". NBC Sports. Retrieved September 29, 2018. ↑ Ramsay, Dr. Jack (2004). Dr. Jack's Leadership Lessons Learned From a Lifetime in Basketball. John Wiley & Sons. p. 98. ISBN 978-0-471-46929-2. ↑ "Larry Bird Statistics". www.basketball-reference.com. Retrieved March 16, 2009. ↑ "1979–80 NBA Season Summary". www.basketball-reference.com. Retrieved May 17, 2008. ↑ "1980 NBA Finals Composite Box Score". www.basketball-reference.com. Retrieved February 28, 2009. ↑ Shmelter, Richard J. (2012). The Los Angeles Lakers Encyclopedia. McFarland & Company. p. 216. ISBN 978-0-7864-6683-2. ↑ "NBA's Greatest Moments: Magic Fills in at Center". NBA Encyclopedia: Playoff Edition. Retrieved September 13, 2007. 1 2 McCallum, Jack (June 2, 2006). "Playoff moments can make legends". Sports Illustrated. Time Inc. Retrieved May 12, 2008. ↑ "Magic Johnson timeline". USA Today. July 11, 2001. Retrieved May 8, 2008. ↑ "Houston Rockets". www.basketball-reference.com. Retrieved May 24, 2008. ↑ "Los Angeles Lakers". www.basketball-reference.com. Retrieved May 14, 2009. ↑ Berkow, Ira (November 8, 1991). "Sports of The Times; Magic Johnson's Legacy". The New York Times. Retrieved February 28, 2009. ↑ "Johnson rubs LA's Magic lantern for 25 million bucks". Pittsburgh Post-Gazette. June 27, 1981. p. 10. Retrieved August 12, 2012. ↑ "Lakers' Arduous Season Ends in Victory". NBA Encyclopedia: Playoff Edition. Retrieved May 7, 2008. ↑ "1982 NBA Finals Composite Box Score". www.basketball-reference.com. Retrieved November 3, 2008. 1 2 "Moses Helps Dr. J, Sixers Reach Promised Land". NBA Encyclopedia: Playoff Edition. Retrieved May 8, 2008. ↑ "1983 NBA Finals Composite Box Score". www.basketball-reference.com. Retrieved February 19, 2008. ↑ Schrader, Steve (March 23, 2014). "Ticker: Jerry West still fielding Magic Johnson-Norm Nixon questions". Detroit Free Press. Archived from the original on March 23, 2014. Retrieved May 9, 2017. 1 2 3 "Celtics Win First Bird-Magic Finals Showdown". NBA Encyclopedia: Playoff Edition. Retrieved May 7, 2008. ↑ Lazenby, Roland (2006). The Show: The Inside Story of the Spectacular Los Angeles Lakers in the Words of Those Who Lived It. New York: McGraw-Hill Professional. p. 237. ISBN 978-0-07-143034-0 . Retrieved May 26, 2011. 1 2 3 Thomsen, Ian (October 22, 2009). "Isiah blasts Magic Johnson over criticisms in forthcoming book". www.si.com. Time Inc. Retrieved December 4, 2017. ↑ "1984 NBA Finals Composite Box Score". basketball-reference.com. Retrieved February 19, 2008. 1 2 "Aging Abdul-Jabbar Finds Youth". NBA Encyclopedia: Playoff Edition. Retrieved May 11, 2008. ↑ "1985 NBA Finals Composite Box Score". www.basketball-reference.com. Retrieved May 11, 2008. ↑ "Kareem, Lakers Conquer the Celtic Mystique". NBA Encyclopedia: Playoff Edition. Retrieved May 7, 2008. ↑ "1986 Playoff Results". NBA Encyclopedia: Playoff Edition. Retrieved May 7, 2008. ↑ "1986–87 NBA MVP Voting". www.basketball-reference.com. Retrieved February 19, 2008. ↑ "1987 NBA Finals Composite Box Score". www.basketball-reference.com. Retrieved November 3, 2008. ↑ "Riley Guarantees A Repeat". NBA Encyclopedia: Playoff Edition. Retrieved May 9, 2008. ↑ "1988 Playoff Results". NBA Encyclopedia: Playoff Edition. Retrieved May 7, 2008. ↑ "Bill Laimbeer career summary". NBA Encyclopedia: Playoff Edition. Retrieved September 13, 2007. ↑ Lazenby, Roland (2006). The Show: The Inside Story of the Spectacular Los Angeles Lakers in the Words of Those Who Lived It. New York: McGraw-Hill Professional. p. 261. ISBN 978-0-07-143034-0 . Retrieved May 26, 2011. ↑ "Lakers Capture the Elusive Repeat". www.nba.com. Turner Sports Interactive, Inc. Retrieved May 15, 2008. ↑ "1988 NBA Finals Composite Box Score". www.basketball-reference.com. Retrieved February 19, 2008. ↑ Blevins, Dave (2012). The Sports Hall of Fame Encyclopedia: Baseball, Basketball, Football, Hockey, Soccer, Volume 1. Rowman & Littlefield. p. 499. ISBN 978-0-8108-6130-5. ↑ "1988–89 NBA MVP Voting". www.basketball-reference.com. Retrieved February 19, 2008. ↑ "Waiting Game Ends for Impatient Pistons". NBA Encyclopedia: Playoff Edition. Retrieved May 7, 2008. ↑ "1989–90 NBA MVP Voting". www.basketball-reference.com. Retrieved February 19, 2008. ↑ "1990 Playoff Results". NBA Encyclopedia: Playoff Edition. Retrieved May 7, 2008. ↑ "Michael Jordan Bio". www.nba.com. Retrieved February 27, 2009. ↑ "Praise from his peers". Sports Illustrated. February 1, 1999. Archived from the original on January 21, 2009. Retrieved February 27, 2009. ↑ "Bulls Finally Get That Championship Feeling". www.nba.com. Turner Sports Interactive, Inc. Retrieved May 25, 2008. ↑ "1991 NBA Finals Composite Box Score". www.basketball-reference.com. Retrieved November 3, 2008. 1 2 Friend, Tom (November 7, 2001). "Still stunning the world 10 years later". www.espn.com. Retrieved May 10, 2008. 1 2 3 Dworkin, Sharon Lee, and Faye Linda Wachs. "The Morality/Manhood Paradox: Masulinity, Sport, and the Media." Masculinities, Gender Relations, and Sport. Eds. Jim McKay, Michael Messner, and Donald Sabo. ISBN 0-7619-1272-X. pp. 53–54. Google Books. Retrieved October 12, 2013. ↑ Lazenby, Roland (2006). The Show: The Inside Story of the Spectacular Los Angeles Lakers in the Words of Those Who Lived It. New York: McGraw-Hill Professional. pp. 297–8. ISBN 978-0-07-143034-0 . Retrieved May 26, 2011. ↑ McCallum, Jack (February 17, 1992). "Most Valuable Person". Sports Illustrated. Time Inc. Retrieved May 10, 2008. ↑ Bork, Gunter (1994). Die großen Basketball Stars. pp. 90–94. ISBN 3-7679-0369-5. ↑ Cooper, Jon. "1992 NBA All-Star Game". www.nba.com. Turner Sports Interactive, Inc. Retrieved May 7, 2008. 1 2 3 "Classic NBA Quotes: Magic and Larry". NBA Encyclopedia: Playoff Edition. Retrieved September 13, 2007. ↑ Ten of the 12 players on the team were named on the NBA's list of 50 Greatest Players: "The Original Dream Team". www.nba.com. Turner Sports Interactive, Inc. Retrieved May 12, 2008. 1 2 "Games of the XXVth Olympiad – 1992." Archived July 18, 2010, at the Wayback Machine www.usabasketball.com. Retrieved May 9, 2017. ↑ "The Original Dream Team". www.nba.com. Retrieved February 28, 2009. 1 2 "Magic Johnson wishes he hadn't retired so early (Video)." www.lakersblog.latimes.com, August 2, 2011. Retrieved May 25, 2018. ↑ "20 years of A Midsummer Night's Magic." 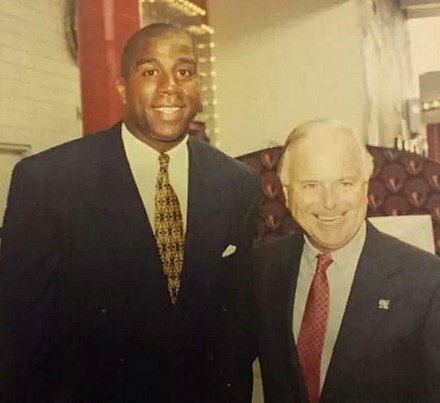 www.magicjohnson.org. Retrieved February 15, 2019. 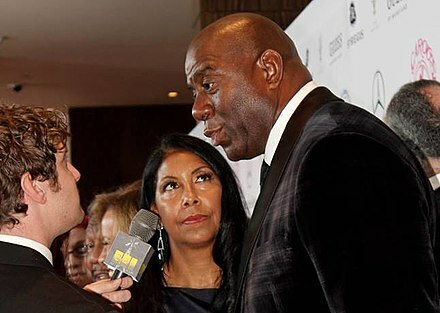 ↑ "Magic Johnson's Gala Midsummer Night Magic Gets $1.3 Mil for UNCF." Jet Magazine , October 19, 1992.Google Books. Retrieved March 28, 2013. ↑ Araton, Harvey. "Los Angeles Lakers hire Magic Johnson to be head coach." The New York Times , March 23, 1994. www.nytimes.com. Retrieved April 4, 2013. ↑ "Johnson gets win in first game as coach." The Fort Scott Tribune , March 28, 1994. Google News Archives. Retrieved April 4, 2013. ↑ Taylor, Phil (April 1, 1996). "On Spring Break". Sports Illustrated. Archived from the original on February 15, 2016. Retrieved December 23, 2017. ↑ Brown, Clifton (May 15, 1996). "Leaving on His Terms, Johnson Retires Again". The New York Times. Archived from the original on February 15, 2016. ↑ "1996 Playoff Results". NBA Encyclopedia: Playoff Edition. Retrieved May 7, 2008. ↑ Rodgers, Ted. "Still Magic." The Sporting News, February 28, 1994. www.business.highbeam.com. Retrieved February 18, 2019. ↑ Outside the Lines: Magic – 10 Years Later, and Limits of Loyalty. Host Bob Ley, Rep. Jeremy Schaap, Kelly Neal, Tim Kurkjian. November 4, 2001. www.espn.go.com – Page 2. Retrieved March 3, 2013. ↑ Lazenby, Roland (2006). The Show: The Inside Story of the Spectacular Los Angeles Lakers in the Words of Those Who Lived It. New York: McGraw-Hill Professional. p. 281. ISBN 978-0-07-143034-0 . Retrieved May 26, 2011. ↑ Brozan, Nadine (January 26, 1995). "Chronicle". The New York Times. Retrieved May 8, 2008. ↑ Swayne, Andrea (March 27, 2012). "Dana Point Resident Earvin "Magic" Johnson Part of a Group Buying Dodgers for $2 Billion". Dana Point Times. Archived from the original on July 25, 2012. Retrieved May 9, 2017. ↑ "'Magic Hour' Canceled". The New York Times. August 8, 1998. Retrieved May 8, 2008. ↑ Sandomir, Richard (October 14, 2008). "Sports Briefing – Pro Basketball; Magic Johnson Signs With ESPN". The New York Times. Retrieved October 9, 2017. ↑ "Magic Johnson Joins ESPN as NBA Studio Analyst". www.espnmediazone.com. October 13, 2008. Archived from the original on December 22, 2008. Retrieved October 15, 2008. ↑ Walk, Gary Eng (October 7, 1998). "Magic Johnson joins the music biz". Entertainment Weekly. Retrieved May 10, 2008. ↑ "The Magic Card." Archived May 11, 2013, at the Wayback Machine www.onlymagiccard.com. Retrieved May 30, 2017. ↑ "About us – Sodexo Magic." www.sodexomagic.com. Retrieved May 9, 2017. ↑ Elan, Elissa (December 8, 2009). "Magic Johnson on his growing foodservice business". www.nrn.com. Archived from the original on February 10, 2012. Retrieved May 9, 2017. 1 2 "Magic Johnson Offers Business Wisdom." www.precinctreporter.com. Retrieved May 9, 2017. ↑ "Starbucks Acquires Remaining Interest in Magic Johnson Enterprises' Urban Coffee Opportunities (UCO)." www.news.starbucks.com, October 21, 2010. Retrieved May 9, 2017. ↑ Llovio, Louis (September 27, 2012). 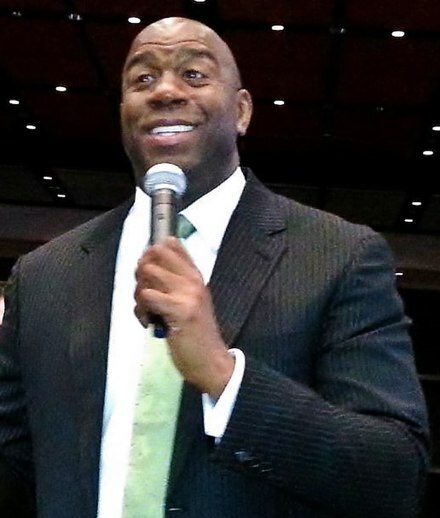 "Magic Johnson wows the crowd and talks minority-owned businesses". Richmond Times-Dispatch. Retrieved February 22, 2019. ↑ Rothbard, Barry (July 20, 2010). "Magic Johnson Says He Wouldn't Have Joined Bird After LeBron James's Move". Bloomberg. Archived from the original on July 23, 2010. Retrieved May 9, 2017. ↑ Son, Hugh (May 18, 2005). "Bank On Condos: NBA Great In $71M Tower Deal". New York Daily News. Retrieved December 23, 2017. ↑ Greenberg, Andy (October 29, 2007). "Manhattan-style condos come to Fort Greene". The Real Deal. Retrieved December 23, 2017. ↑ "Magic Johnson sells Lakers shares". www.espn.com. October 18, 2010. Retrieved October 19, 2010. ↑ "Magic Johnson to Advise Team Ownership | Los Angeles Lakers". NBA.com. NBA Media Ventures, LLC. February 2, 2017. Retrieved February 2, 2017. The Los Angeles Lakers today announced that Earvin "Magic" Johnson will return to the Lakers to assist Jeanie Buss in all areas of basketball and business as an advisor. ↑ Botte, Peter (April 28, 2014). "Magic Johnson reportedly interested in buying Clippers, NBA plans Tuesday press conference on Donald Sterling investigation". NY Daily News. New York. Retrieved May 1, 2014. ↑ "Magic Johnson buys life insurance company". USA Today. June 23, 2015. Retrieved June 23, 2015. ↑ Plaschke, Bill (December 2, 2011). "Magic Johnson leads dream team bidding for Dodgers". Los Angeles Times. Retrieved January 3, 2013. ↑ "Dodgers sold to Magic Johnson group". www.espn.com. March 28, 2012. Retrieved March 28, 2012. 1 2 Shaikin, Bill; Wharton, David (March 27, 2012). "Magic Johnson-led group is picked as Dodgers' next owner". Los Angeles Times. Retrieved May 14, 2013. ↑ Fisher, Mark. "New Dragons owners say they won't mess with success", Dayton Daily News, July 2, 2014. Retrieved November 16, 2018. ↑ Heath, Thomas. "Capital Buzz: D.C. businessman buying Dayton baseball team", The Washington Post, July 13, 2014. Retrieved November 16, 2018. ↑ "Magic Johnson, 55, Los Angeles Sparks Co-OwnerMagic Johnson, 55, Los Angeles Sparks Co-Owner". ESPN . Retrieved December 18, 2014. ↑ "MLS Wants Fans' Help To Pick Team Name, Logo For New 'LA Football Club'" CBS, October 30, 2014. Retrieved October 31, 2014. ↑ "LA's MLS expansion team announces official club name: Los Angeles Football Club". www.mlssoccer.com. September 15, 2015. Retrieved May 31, 2018. ↑ Finnegan, Michael. 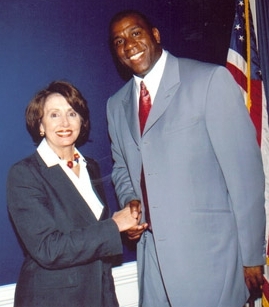 "Magic Johnson backs Angelides for Governor". www.angelides.com. November 29, 2005. Archived from the original on December 22, 2007. Retrieved September 13, 2007. ↑ "Magic Johnson, Bill Clinton team up for Hillary". USA Today. December 20, 2007. Retrieved May 10, 2008. ↑ "Magic Johnson Backing Barbara Boxer for U.S. Senate." www.thirdage.com, August 10, 2011. Retrieved May 9, 2017. ↑ "Earvin Magic Johnson on Twitter". Twitter. Retrieved June 20, 2016. 1 2 3 4 McCallum, Jack (August 20, 2001). "Life After Death". Sports Illustrated. Time Inc. Retrieved May 15, 2008. 1 2 3 4 Farrey, Tom (November 7, 2001). "AIDS community misses old Magic act". www.espn.com. Retrieved May 15, 2008. ↑ Rhoden, William C. (September 16, 1998). "Sports of The Times; The Greatest Is Honored by The Diplomat". The New York Times. Retrieved May 15, 2008. 1 2 Sternberg, Steve (November 30, 2006). "Magic Johnson combats AIDS misperceptions". USA Today. Retrieved February 16, 2009. ↑ "Magic Johnson assists drugmaker to advertise HIV treatment". USA Today. January 20, 2003. Retrieved February 17, 2009. 1 2 3 "Magic Johnson Career Stats". NBA Encyclopedia: Playoff Edition. Retrieved May 8, 2008. ↑ "All-Time Playoffs Individual Career Leaders". NBA Encyclopedia: Playoff Edition. Retrieved May 8, 2008. ↑ Wojnarowski, Adrian (November 18, 2006). "Making triple trouble". Yahoo! Sports. Retrieved September 13, 2007. ↑ "The NBA at 50". www.nba.com. Turner Sports Interactive, Inc. Retrieved May 15, 2008. ↑ "Johnson, Brown elected to Hall of Fame". www.espn.com. June 5, 2002. Retrieved May 15, 2008. ↑ Forrester, Paul (February 16, 2007). "Top 15 All-Star Weekend moments". Sports Illustrated. Time Inc. Retrieved May 12, 2008. ↑ "The 60 Greatest Playoff Moments". NBA Encyclopedia: Playoff Edition. Retrieved May 12, 2008. ↑ Bork, Gunter (1995). Basketball Sternstunden. pp. 49–55. ISBN 3-7679-0456-X. ↑ Halberstam, David (June 29, 1987). "The Stuff Dreams Are Made Of". Sports Illustrated. Time Inc. Retrieved May 12, 2008. ↑ Neal, Rome. "'Magic' Time". www.cbsnews.com. September 26, 2002. Retrieved October 13, 2013. 1 2 "Larry Bird inducting Magic Johnson". www.cbc.ca. August 15, 2002. Retrieved May 8, 2008. ↑ Schwartz, Larry. "Eye for victory". www.espn.com. Retrieved February 28, 2009. ↑ Sheinin, Dave (December 13, 2009). "Book review: When the Game Was Ours by Larry Bird and Magic Johnson". The Washington Post. Retrieved September 12, 2016. ↑ Clinchy, Evans (March 6, 2010). "HBO Documentary Revisits Magic Johnson–Larry Bird Rivalry That Saved Basketball". NESN.com. Retrieved October 31, 2018. ↑ Marcus, Jeff (2003). Biographical Dictionary of Professional Basketball Coaches. Scarecrow Press. pp. 189–191. ISBN 978-1-4617-2653-1. Wikimedia Commons has media related to Magic Johnson .